I was kinda browsing and saw the ULTIMATE GM SCREEN which I thought was the coolest thing ever! (Sorry for the CAPS-shouting, but I thought it deserved it). Okay so it’s kinda a cut-out and put together yourself, but I’m crafty and that sort of thing appeals to me. What you get is a Castle Wall that sits in front of the GM with two Dice Towers (basically you drop the dice in the top and they roll out at the bottom). It’s very solid so it won’t fall over (a common problem with GMs screens) not to mention it looks absolutely fantastic! The idea of Dice Towers is new to me but I kinda like them; it adds a drama to rolling the dice plus makes it less likely for players to cheat by hiding/fudging their rolls. There’s also space on the back for the GM to stick all the gaming tables and handy info s/he needs to run the game. And there are little shelves for figures! How cute! And they can stand on top of the turrets! 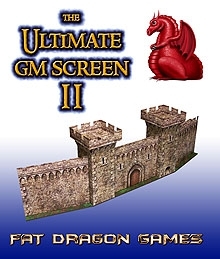 Overall I think it is very deserving of it’s title as the ULTIMATE GMs screen. I’ve stuck a video below which really shows the GMs Screen in all its glory. You may want to skip to half way as that’s when you start getting a really good look at it. And it is reduced by 25% this week as part of the GMs Day Sale! Click here to go to a list of all the reduced items at DriveThruRPG. In case the video is not showing up here’s a link to it.